Zurich is the largest city in Switzerland. It's an expensive place to visit so many independent travelers seek out hostels that are affordable. Finding a cheap place to stay is essential because eating out and entertainment can get quite expensive. Many hostels also have shared kitchen facilities so guests can prepare their own meals. Staying at a hostel also creates a social environment where solo travelers can meet others and find friends that share common interests. How much do hostels in Zurich cost? 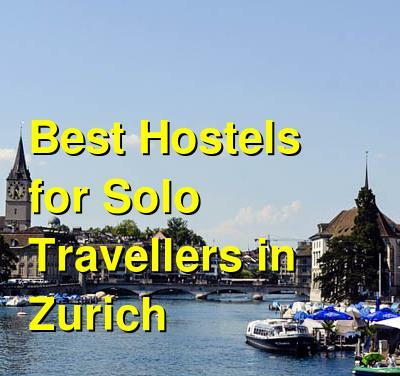 Zurich Youth Hostel is one of the most popular places to stay for solo travelers and backpackers and it is a great place to meet other travelers. There is a large entry way and common area where guests enjoy chatting about their travelers and swapping stories. There's also a large television that gets international channels, several game tables, and plenty of places to relax after a long day exploring the city. The common area is open all day and night, every day of the year. Despite it's social vibe, it is still possible to find a quiet retreat in your room. Rooms range in size from one bed to five, so if you want some personal space and privacy, that is possible for a reasonable price. The hostel also offers a traditional Swiss breakfast every morning before you head out to explore the city. Lunch and dinner are also served for a reasonable price. The hostel is conveniently located about twenty minutes from the main railway station. You can walk to Lake Zurich in about ten minutes and slightly further to the new Rote Fabrik cultural centre. City Backpacker is located in a quaint part of the city, in the pedestiran only area right in the heart of the old part of town. You can easily walk to most of Zurich's most popular attractions and it's also near the shopping street of Bahnhofstrasse. The hostel is close to some of the city's best nightlife, music, and entertainment options. City Backpacker is an affordable option for budget travelers who don't want to spend too much. There are dorms available that sleep a maximum of six people. If you want a little more privacy, you can also choose between single, twin, triple, or quad rooms. Bathrooms are shared. There are a variety of amenities available to guests including kitchens, free drinks, lockers, internet, laundry facilities, luggage storage, and discounts on souvenirs. The staff at this hostel is wonderful and very knowledgeable on the city. They are helpful with information and work hard to keep the hostel's atmosphere social and comfortable. It's a great environment to meet other solo travelers or backpackers. The living room and rooftop terrace are great places to relax and there always seems to be someone nearby you can chat with. Langstars is a social hostel with a cafe and bar on the ground floor. The bar is popular with tourists and locals alike, so if you want to step outside of the tourist scene and experience a bit of the "real" Zurich, then this is a great place to stay. The hostel hosts free concerts every Wednesday as well. If you're looking for a place to sleep soundly at night, then this is probably not the best option for you. But if you're looking for a fun crowd and a vibrant music scene, then this is your place. The staff is wonderful and keeps the social atmosphere of the hostel lively. There always seems to be something going on. They are knowledgeable on the area and can recommend the best places to get a drink or some food. The hostel has 42 beds with seven dorms available. The beds are reasonably prices and provide a good option for solo travelers. If you want to experience the trendy side of Zurich, then this is the place for you. Hotel Allegra is a traditional hotel, not a hostel. It offers a variety of excellent amenities that you might expect in a hotel setting. If you're traveling alone and looking for a comfortable and quiet place to sleep for a few nights, then this is a good option at a reasonable price. Hotel Allegra is a family run hotel with a friendly atmosphere. There are 132 rooms, each with between one and five beds. Rooms have private bathrooms, televisions, telephones, and free wi-fi. The beds are comfortable and quiet so if you're looking for a peaceful setting and a good place to sleep, then this is a good option. There's also an on-site restaurant that serves both French and Swiss dishes as well as a bar where you can enjoy a drink. Guests can also enjoy a fitness center, rope course (for an additional fee), and an outdoor trail. Guests also receive free access to a public swimming pool that is just a three minute walk away. Breakfast is available for an extra charge.